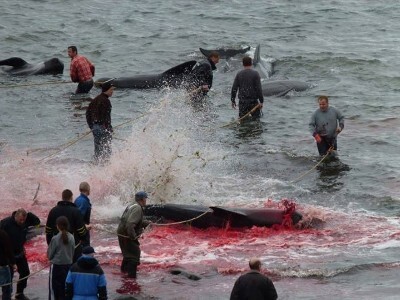 On August 13th, 135 long-finned pilot whales were brutally slaughtered in Húsavík. It’s been an extremely bloody few weeks in the Ferocious Isles, even by Faroese standards. On August 8, 107 Long-finned Pilot whales were slaughtered in Sandavágur. On August 11, 21 were butchered in Leynar and on the 13th, 135 lost their lives in Húsavík. The grind(adrap), as the Pilot whale drive is called, has a recorded history since 1584. There are 23 whaling bays assigned to six districts in which the meat and blubber are divided among the population. A drive is initiated when fishermen or ferries offshore sight dolphins. The dolphins are driven into a bay with boats and even jet skis and pulled up onto the beach with a hook in the blowhole. Then the spinal cord is cut with a knife. The Húsavík massacre on the 13th was not the only one that took place that day. In Hvalba, the incredibly high number of 430 Atlantic White-sided dolphins were driven into ‘whale bay’ and brutally murdered. Some people might be surprised to hear that these islanders are targeting species other than Pilot whales, but they have always hunted smaller dolphins, especially in Hvalba. They last killed Atlantic White-sided dolphins in Hvalba in August 2010 and Risso’s dolphins earlier that year in April. Oravik took 100 Atlantic White-sided dolphins in August 2009. That same month, Hvalba killed two Northern Bottlenose whales that were reported as stranded, and a month later Klaksvik took three Risso’s. In June 1978 that town even butchered 31 Orcas. An unscheduled meeting between Japan’s whalers and environmental activists on the high seas seems an unlikely backdrop to an outbreak of détente. But Australia was quietly celebrating a minor victory for diplomacy on Tuesday after Japan agreed to release three anti-whaling activists who illegally boarded one of its whaling ships over the weekend. 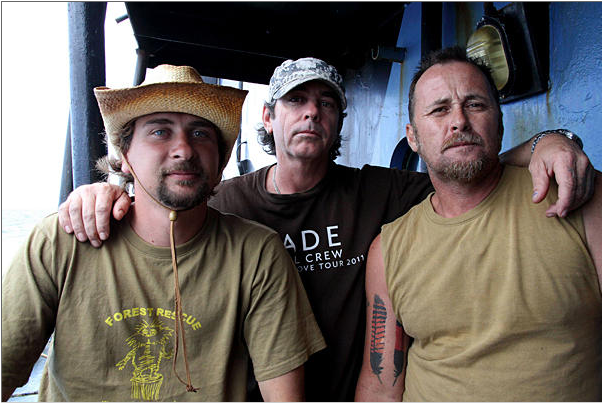 The trio, all Australian citizens, have been detained on the Shonan Maru 2, which is providing security to the fleet, after clambering aboard early Sunday morning to protest Japan’s annual hunts in the Antarctic. The International Whaling Commission banned commercial whaling in 1986 but allows Japan to hunt a limited number of whales for “scientific research.” The fleet left port last month with plans to kill some 900 whales this season. The incident threatened to cause tension between Australia and Japan, close trade and security partners. Soon after the men were detained it seemed likely that they would be kept aboard the Shonan Maru 2 and taken to Japan, where they faced a trial and possible imprisonment for trespassing.